Admire majestic mountain peaks, alpine meadows full of wildflowers, pretty villages and emerald lakes during your panoramic train rides through Switzerland. St.Moritz is one of the most alluring holiday resorts in the world with its spectacular views, valley of wide-open spaces and exciting contrasts makes it a holiday paradise of summer and winter sport activities. Transfer to Zurich railway station . Board the train to Chur and transfer to the famous red train to lovely and St. Moritz located on the shores of a lake with the same name. You will pass through beautiful mountain scenery, snow-covered peaks and meadows full of wild flowers and through the stunning Albula gorge. Arrival at St Moritz station, transfer to the hotel. Overnight in St. Moritz. After breakfast board the famous Glacier Express train and from your comfortable panoramic car enjoy spectacular scenery of the Swiss Alps with its dense forests, mountains, snow covered peaks and charming villages. Arrive at Zermatt at the foot of Mount Matterhorn with its famous pyramidal peak near the Italian border. Overnight at Zermatt. Full day in Zermatt with time to explore this car-free village and do some shopping. Optional activity to use the Gornergrat train tickets for the highest open-air railway to admire spectacular views of the surrounding twenty peaks including the famous Matterhorn. In the afternoon you travel to Interlaken for overnight. 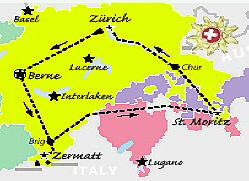 A cogwheel train will take you Jungfrau, the top of Europe,. Reach Europe highest train station at the altitude of 3444 m. Walk around the year-round winter landscape of snow and ice and enjoy spectacular views of the surrounding Alps. Return to Interlaken. The rest of the day is on your own for own activities.